I really like blogging, can you tell? I look forward to it. I am short on time again today, though, so it'll be a quick one. Ok, Boston. Craft Magazine Party. My killer goodie bag from The Sampler. Yeah, baby! Sparkley gluey stuff, pink crystals! Unicorn embroidery patterns from Sublime Stitching! From Botanical Earth. Oh, bummer. I just looked them up to link, but their site is down and it says they are closed. They hope to reopen in July, so I am linking anyway, in hopes that they do. Ooooh, a stamped brown box-I love it already. A sweet (stamped!) little ceramic dish. Wait a minute, what's that on there? That's right, a bee! Yay! There were a few other items, too, but this was the bulk of it. Isn't it awesome? Makes me want to get a Sampler every month! I hate to tell you this, but I didn't take any pictures at the actual event. like to pretend that Alison (the new boss of The Sampler) insisted that I take these buttons and circles of fabric home. But it was more like she allowed me to, since I wanted them so bad. Tee hee. I had been wanting to learn how to make these for ages- it is so easy! I want to make a million of them. Perfect little craft for the couch. 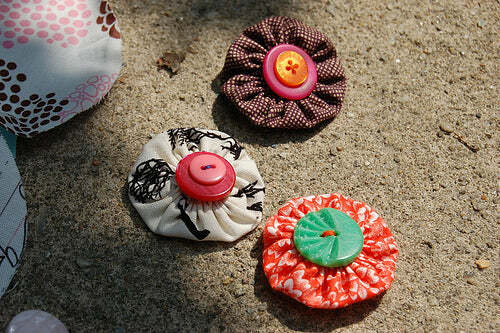 It occurred to me as I was sitting there in Greenward making these: Someday soon, I will be making yoyos with my own fabric! Off to work now, friends. I'll be back soon.